I hope you are staying warm and recovering from all the joys of this past holiday season. My goodness. It’s already mid-January. How time flies, right? For this post, I’d like to share a sweet treat that is just perfect for the winter season: Warm Apple Crumble. So simple. So tasty. So warm and delicious. Apple Crumble is like warm apple pie meets sweet crumbly goodness. Nothing wrong with that, eh? I like to use tart apples and a bit of lemon in this recipe because it keeps the dessert from being too overpoweringly sweet. Trust me – it’s amazing. The best part of this dessert is how forgiving it is. You can taste as you go. So, if you don’t quite like it, change it. Too sweet? Add some lemon juice or zest. Too sour? Add some sugar. Too bland? Add some cinnamon. Make the Apple Crumble in either individually-sized portions or in a large casserole dish to scoop out and serve. Either way is fine and both will provide apple-crumbly-goodness. Or, use oven-safe mugs for a cute presentation at your next winter party. If you’d prefer, you can substitute fresh peaches or plums in this recipe. Just make sure you de-skin them. Click here for instructions on how to peel a peach. Also, since plums and peaches are naturally less crisp than apples, you can bypass the step of cooking them prior to baking the crumble. Warm your soul and your tummy with this easy Warm Apple Crumble recipe. In a large mixing bowl, combine the apples, ¾ cup of the sugar, lemon zest, lemon juice and cinnamon. Toss to evenly coat the apples. Heat a large sauce pan or skillet over medium-high heat. Add 2 tbsp. butter and allow to melt. Cook apple mixture over medium heat, stirring occasionally, for 8 to 10 minutes or until apples are almost tender. Taste the apples and add sugar, lemon juice or cinnamon at this point as needed. It's okay if it isn't too sweet, as the flour-sugar topping will be sweet enough to balance it out when baked. In a separate mixing bowl, combine flour, remaining ½ cup sugar and cubed butter. Using your fingers, mix together until cubes are evenly distributed. 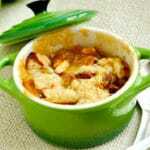 Fill casserole dish or individual servings with apple mixture and then add topping. Place on baking sheet lined with aluminum foil and bake, uncovered, 20-25 minutes or until topping is golden brown and apple mixture is bubbly.